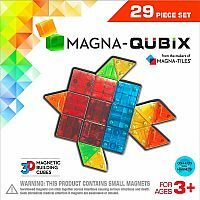 The brand-new building set from the Magna-Tiles family, Magna-Qubix, feature an array of new shapes including cubes, prisms and pyramids. Anything your children can dream, they can build with magna-qubix!each translucent and colorful shape measures about 1 inch by 1 inch and can be used with your favorite Magna-Tiles sets and other favorite toys. Magna-Qubix are made with high-quality magnets that are safely secured inside of each shape. Not only are Magna-Qubix fun, but they also help develop fine motor skills as kids stack, build, Count, match and “click” together their creations.